I am very happy to be participating again in Blogger's Quilt Festival hosted by Amy's Creative Side. 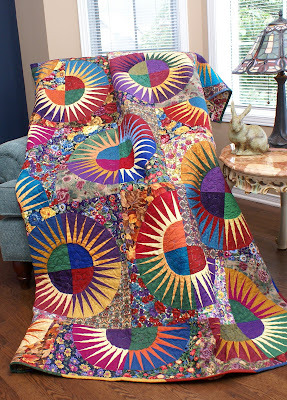 This is such a great way for blogging quilters to showcase their quilts - thanks Amy. My entry is this New York Beauty quilt I made in 2003 using as many brights and floral fabrics as I could find. 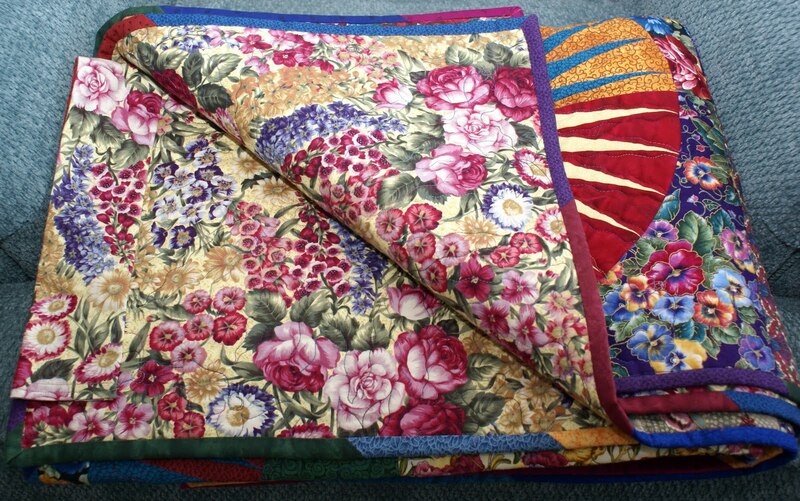 The blocks were paper-pieced and the quilt was quilted on a long-arm machine. This quilt is special to me because my husband says of all the quilts I have made this is his favourite. I used a large bright multi-floral print for the backing. The sleeve sewn onto the back is because this quilt once hung on display in a local quilt shop - that also makes it kinda special to me. I'm off now to check out the hundreds of other quilts on display at Bloggers Quilt Festival. This is just stunning. I absolutely love this quilt! I have always wanted to make one of these, now that my kids are older maybe I'll have time. Beautiful work! Wow! That quilt is stunning! Very beautiful quilt work ! What can I say? Stunning. I'd love to make one myself, but for some reason resist paper piecing and I know it just doesn't work the same. Congrats on the fabric choices... and on the patience dealing with all those spiky points! Fabulous! Gorgeous colors and worksWOmanship. That is a really beautiful quilt! I love the bright fabrics! Wow, those colors are great. Thanks for sharing your quilt with us! love new york beauty quilts and you've done a very nice job on this one. i like it with just a binding, too. sets off the design so well. love sophie--i grew up with suzie belle--another black cocker. can't tell you how many times i sat on the porch complaining to suzie who always understood my little heart broken over something then quickly was romping with me when all was well! NYB is one of my favorite patterns and yours is absolutely gorgeous! I have a NYB that's been a UFO for several years. Your Beauty is providing inspiration to pull it out again! I really like your Baskets quilt too. This quilt is fabulous. I love all the color. When I pulled up the blog site my first reaction was WOW!!!! Good Job!! I love your New Yokr Beauty quilt. I sure hope I can make one. I enjoy the photos of the fur-kids. They are all adorable. Beautiful New York Beauty quilt!